On the evening of November 31st St Margaret’s choir performed on stage to a packed audience. They sang very well indeed and we are very proud of them. 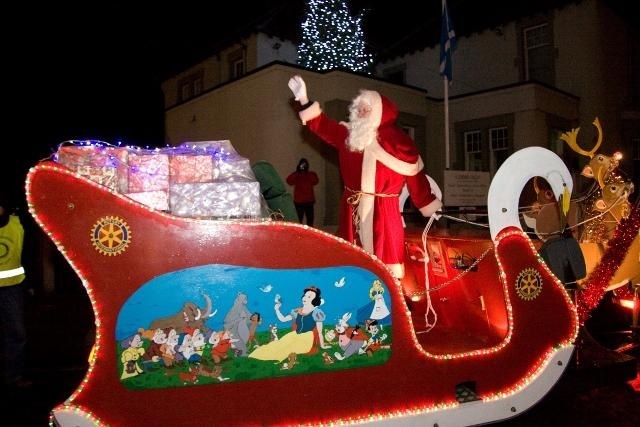 It was a terrific night and the town looks fabulous decorated for Christmas. “Thank you all for a wonderful performance on stage in Queensferry last night. I have received many excellent comments from audience members, with the emphasis being on how slick and professional the show was, and on how well everyone sang and played. Many thanks indeed for sharing your thoughts with us, it’s often over looked how useful we find feedback and appreciate your kind comments. All the children and staff at St Margaret’s wish you a happy and peaceful Christmas season. St Margaret’s RC Primary football stars of the future! On Saturday the 18th of February there was a school tournament. Four schools battled against each other to win a trophy. The schools that took part were Kirkliston PS, Queensferry PS and Echline. We played 4 games, we lost two, drew one and won one. Our team included P5s, P4s and P6s. All schools had a blast. Kirkliston and Echline were in the final. Echline went 1-0 up and Kirkliston pulled it back with an outstanding performance and made it 5-1. After the nail-biting match we had a presentation from Archie Duckworth’s Dad. We got presented with a medal and Kirkliston got the trophy. 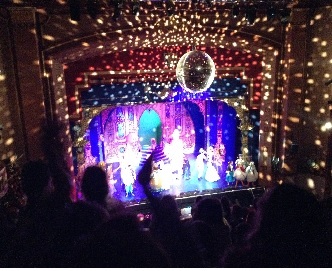 Report by M. G. and S.C.
Alhambra theatre to see the panto…. Mother Mc Goose. we were singing songs and chatting to our friends. We arrived at the Alhambra for 10.15am. The show started at 10.45am. I liked the show because the songs and dancing were amazing. You were able to get up to dance and sing with actors. We got on our and drove bus back to south Queensferry. 11th November 2016. Thank you to Sustrans for hosting an ibike Breakfast at the school. Lots of family and pupils enjoyed a continental breakfast and warm teas & coffees before school today. This was organised to help promote healthy living and active travel in our community. Many thanks again to all who attended and to all the Sustrans team and Active Schools for making it possible. Parent Council raise funds for new ipads! Our amazing Parent Council have again pulled out the stops to successfully raise a massive amount of funds to go towards new ipads to aid the children’s learning. A BIG thank you for all their hard work, especially to Mr Tait, Mrs Jamieson and Mrs Espey and indeed to all the people who contributed and gave generously. The children had a wonderful time on the walk and the local community and shop owners were all involved in the fun and frollicks of the Spooky Walk! We look forward to getting all our new ipads. 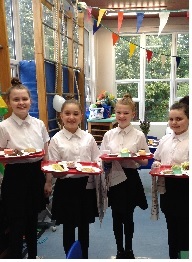 The P.7 pupils would like to thank everyone for supporting and attending the MacMillan Coffee Morning which we hosted last Friday, on the 30th September. 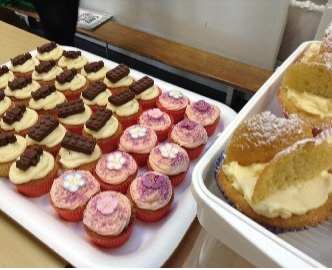 Successfully, we raised over £460 pounds! First of all we wish to acknowledge the parent helpers who served drinks. Also, a special thanks goes to the families who generously contributed their delicious baking. There would have been no coffee morning without them! It was extremely exciting having so many people attend this event. 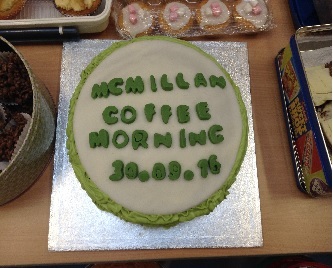 We are very proud of ourselves, organising and running this coffee morning for such a worthwhile cause. All the pupils in P7. As part of celebrating our wide and rich diversity here at St Margaret’s on the 26th of February we held a World Food Day celebration where we shared traditions and cultures from all over the world. Children have worked hard to organise this event because so many of our pupils and their families originally came from all over the world to Scotland and we wished to recognise and celebrate this. Primary 1: Poland & Ireland. Primary 2/3: Spain & Lithuania. Primary 3/4: Gambia, Greece and India. Primary 4/5: Madagascar, France & Cyprus (Greece). Primary 6/7: Italy & Scotland. 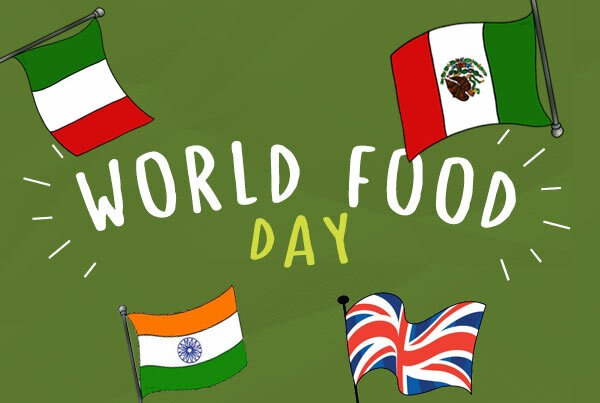 “World Food Day was a spectacular event where we could bring and try foods from countries all over the world: India, Africa, Poland. I enjoyed trying olives for the 1st time, I liked them!” Casey. “I helped create a Italian and Scottish Café. We were serving pizza, pasta, haggis, neeps and tatties. Our customers were overjoyed with the food, and the service!” Martha. 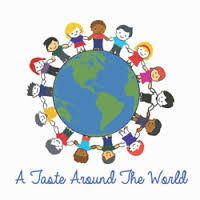 The pupils from P6/7 who helped organise World Food Day did a fantastic job. They worked alongside our EAL teacher Mrs Paige and Mr O’Connor. It was lovely to see so many families who hail from one of these countries sending some information, and traditional recipes to share. Some children even brought a dish for people to taste. Many thanks as always to all our children and families for your continued support. It was a fabulous morning and nobody needed lunch afterwards! As part of the South Queensferry Christmas lights switching on ceremony, children from St Margaret’s RC Primary School Choir participated in a carol singing extravaganza on the high street. The organisers and the public thought the children were fantastic! We all celebrated Día de Muertos on Friday the 30th October. We looked at the annual tradition in Mexico and how it is celebrated. ‘Day of the Dead’ (Spanish: Día de Muertos) is a Mexican holiday celebrated throughout Mexico, in particular the Central and South regions, and acknowledged around the world in other cultures. The holiday focuses on gatherings of family and friends to pray for and remember friends and family members who have died, and help support their spiritual journey. 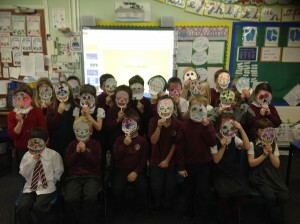 All our classes experienced different art, food technology, mask making and poster writing. We had lots of fun. Thanks to all our staff, especially Mrs Baxter and also to our fabulous parent helpers!